Here is a healthy snack when you are looking to incorporate more fiber and protein into your diet. Chickpeas, also called garbanzo beans, are inexpensive, readily available in your local supermarket, and packed with fiber, protein, folate and iron. These chickpeas are oven roasted and seasoned to taste for a delicious high fiber snack. 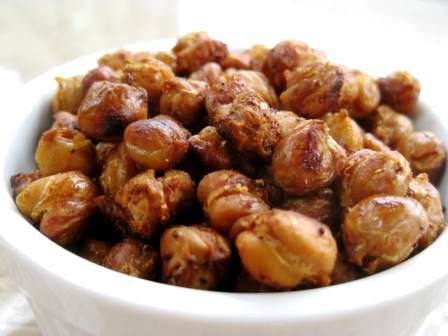 Spicy roasted chickpeas are crisp and when you roast them they shrivel up into peas – tiny, easy to eat, and addictive. This is one snack that you can feel good about munching. Roasted chickpeas will keep you full and satisfied and the addition of olive oil will also give you a healthy dose of monounsaturated fat…the good fat! These chickpeas are addictive when you are craving something crunchy and salty (i.e. chips, pretzels). I think I may have found my new go-to snack! Make sure you eat these soon after you’re done roasting them for max flavor and crunch! Blot chickpeas with a paper towel to dry them. In a bowl, toss chickpeas with olive oil, and season to taste with salt, garlic salt, and cayenne pepper. Spread on a baking sheet, and bake for 30 to 40 minutes, until browned and crunchy. Watch carefully the last few minutes to avoid burning. I think I will make these right now! Sounds tasty and a good Saturday snack. Spicy roasted chickpeas sound interesting & right. Now do your chickpeas taste really as good?! btw, Happy National Pie Day! Great blog! I have a family recipe like this that I LOVE, only downside is that fresh cranberries aren’t always easy to come by 🙂 Run Happy- looks like you have a lot of races coming up in 2010!